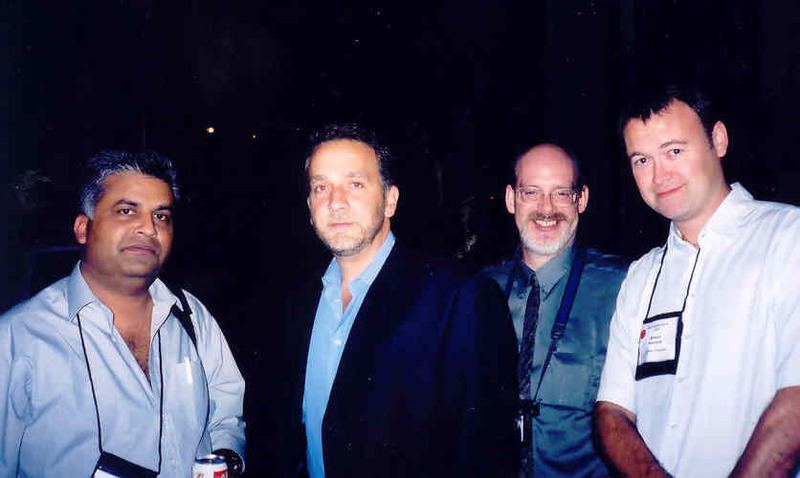 Back in 1999 I had been hanging around on some mystery related newsgroups, had been for a few years at that point. Some of the people there were talking about something called Bouchercon. 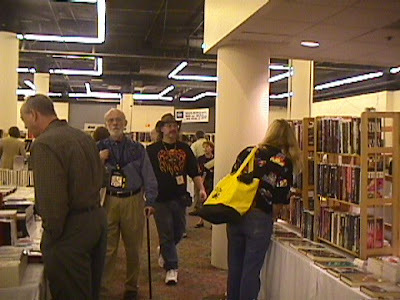 I soon discovered that it was a convention of fans and authors and people who loved the same books i did. I ended up helping out the local mystery bookstore, Mystery One, with their booth in the book room. Within 24 hours I was hooked like a crack addict. So many authors all in one place! Great panels! and I met a ton of like minded people, many of whom are still friends today. (Jeremy Lynch for one). I also met a woman I would marry exactly a year later on Saturday night. I started doing reviews. I was no longer just a fan. I was part of a community. Things led to things and Ruth and I decided to start publishing a magazine. Our first meeting was at Bouchercon in Las Vegas. We debuted the Magazine in Toronto at Bouchercon. On the way home after Toronto Ruth had a crazy idea. She wanted to host a Bouchercon, in Baltimore. In 2008 she did just that with our good friend Judy Bobalik. It was a rousing success. It was also at this Bouchercon where I put in a bid to host a Bouchercon, along with David Thompson and McKenna Jordan. And if you know us, you know that next year I am bringing the Bouchercon traveling road show to St. Louis, the gateway to the west. Bouchercon has become a major part of our lives. We meet people there who become our second family. We hook up with people we sometimes only see every year, or every other year. (Ayo, Ali, Thalia, Val, RJ, Mark, John…) I still have at least 1 fanboy moment every year. In Toronto I met Michael Slade, in Madison I met Stephen Cannell, in Milwaukee I met Ian Rankin and Val McDermid. And I also meet people who are just getting started. i remember asking Blake Crouch to sign an arc of a book that wouldn’t be out for months to come. I was his first book signing experience. I think I remember telling him he was a disturbed sick f#%ker and thinking him for it. Bouchercon is a fan convention, and this includes the authors who come to it. We gather together to celebrate this genre filled with murder and death and investigation and justice and good guys and bad guys. It’s the books that bring us all together. But it’s the friends we make that keep us coming back year after year.I never get to spend enough time with these people. But I’ll never stop trying. 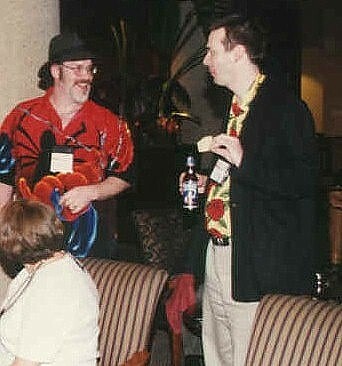 So thank you Ted Hertel and Gary Warren Niebuhr for putting on Milwaukee 1999’s Bouchercon. Thank you Reas Helmsworth for doing this year’s convention. And thank you to every single person who has ever taken on this insane task and all the people who help make it work. And a big thanks to all the people who come year after year. You are all family to us, some of you we just haven’t met yet. Unfortunately I won't be coming to this year's Bouchercon, but depending on finances & the success of my 2 releases next year, I hope to attend the St. Louis one. I'm deep in Bouchercon envy now of those who are going this year! Ayo, You are one of the people we mean when we say family. Seeing authors is great, but i come more for friends and family now, which covers a lot of people! I remember you slapping my leg when we got the bid! Well Jon, I can only say that I would not have enjoyed my first B'Con in Chicago so much if I had not gone with my "extended" (read Jordan) family. Not everyone would collect a virtual stranger whom they had only been in contact with via email and because of their contribution to the mag and allow them into their home and feed and look after. You have my undying gratitude! You guys are the best and I can't wait to see you next year in St Louis! I remember sitting beside you and David at Baltimore when the bid was made! As you say, B'Con is not solely about the authors but also the fans!